Herein slept the president in October 1789, guest of a wealthy merchant in Salem. SALEM — The first POTUS stayed here, at what is now The Merchant hotel, on Oct. 29, 1789, a few months after his inauguration. The Merchant is planning a party to mark the date next October, but in the meantime, guests can stay in the same suite that Washington did (albeit in a bigger bed) and gaze out at a landscape that is a bit different. At that time, a wharf jutted into what is now Washington Street; now, there are shops and restaurants and, next door, a Dunkin’ Donuts. 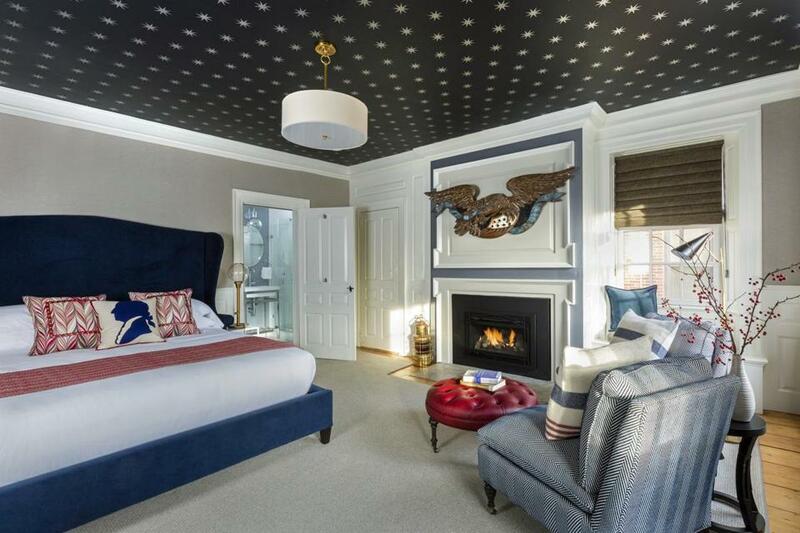 Unveiled as The Merchant in November, this handsome Federal style building — never a hotel until now — was built in 1784 for Joshua Ward, a sea captain turned merchant who traded in Sumatran pepper and molasses (for rum), among other things. Renowned architect Samuel McIntire designed the home. During the $2 million renovation, builders found a boatload of antique rum bottles. Empty, of course. Riffing on the theme, guests get a welcome gift of Sumatran pepper and a recipe for a rum-and-pepper cocktail. It’s a metaphor for The Merchant: history, served with a shot of spice. The eleven guest rooms, each around 500 square feet, are all slightly different, but each is vibrant and colorful, with the signature bold touch of Boston designer Rachel Reider. (A mirror encircled with porcupine quills? Yes, indeed — and it works.) Modern amenities like iPads, 40-inch LED TVs, and free Wi-Fi would’ve probably made President Washington’s stay a bit more pleasant, and he may have appreciated the waffle robes and luxury bath products. Each room has a working gas fireplace and heated bathroom floors to up the coziness factor. The guest lounge has two fireplaces (one is wood-burning), a copper-topped bar, and a portrait of the owner’s great-great-grandmother. The silver insert in the wood-burning fireplace was fashioned by Paul Revere. Breakfast tapas will be served in the lounge early next year; for now, guests receive a voucher for breakfast at local cafe. In warmer weather, a second-floor deck will entice guests with its view of downtown. Its heart-of-the-city locale makes The Merchant an easy weekend escape for Bostonians, who can take the commuter rail to Salem and walk to the property. The hotel offers drivers free parking at a nearby garage. Numerous restaurants and clubs are all a short walk, including Opus, the Gulu-Gulu Café, Life Alive, and Naumkeag Ordinary. The Peabody Essex Museum is a 10-minute walk. Speaking of the PEM, The Merchant is offering a grand opening special for a two-night stay till Dec. 23: 10 percent off room rates, two tickets to the museum, and a $20 dining credit for Naumkeag Ordinary. THE MERCHANT 148 Washington St., Salem. 978-745-8100, www.themerchantsalem.com. Rates from $204.